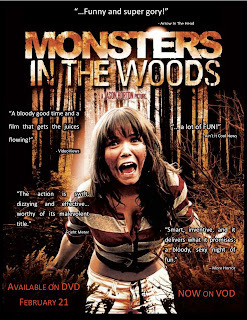 Monsters in the Woods begins a limited DVD release Feb. 21st. It's a rough time for indies. With the current fractured market place it can be extremely hard for an indie to reach its audience. Monsters in the Woods is a movie deserving of an audience. So take the time to track and down and check it out. It will depend on how well the movie sells through these outlets that will determine whether or not it gets an increased availability and release. If you're on the fence, dive in and check it out. There's no one trying to get rich off this flick. We just want the opportunity to have our movie seen by as many folks as possible. Check out some reviews here.